This page directs you to some of the events happening in Dorchester. The Corn Exchange - if you would like to see what is going on in the Corn Exchange click here. Information about Dorchester Borough Gardens Events 2019 will appear here shortly. Information about Maumbury Rings Summer Events 2019 will appear here shortly. Dorchester Arts Centre arranges a varied programme of activities throughout the year. Click here to go to their website. For more general information about events in and around Dorchester click here to visit Dorchester Dorset. 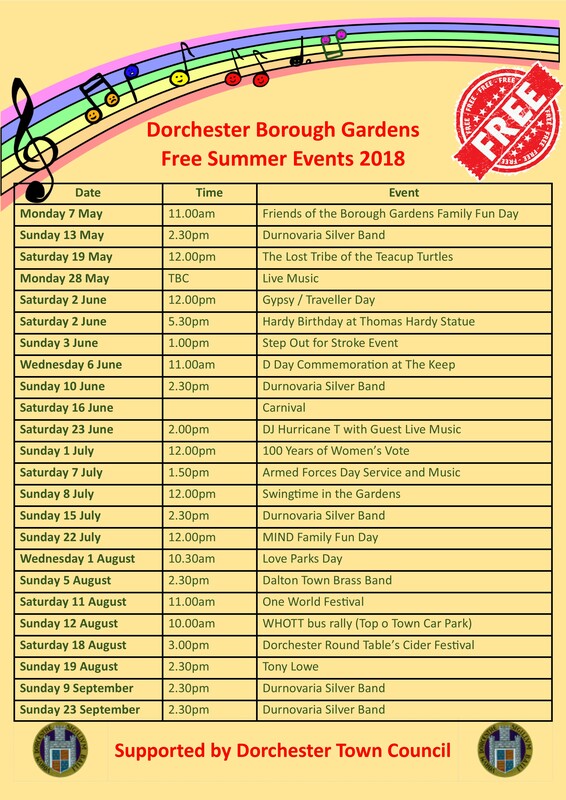 You can find out about more events happening in and around Dorchester by calling into Dorchester Tourist Information Centre in the Dorchester Library and Learning Centre, South Walks House, Charles Street, Dorchester, DT1 1EE.